A large, scarlet Cannonball Flower blossoms from an even larger evergreen called the Cannonball Tree–so named for the seed-rich, 20 centimeter in diameter fruit it produces. This beautiful flower does not produce nectar, so therefore relies on attracting pollen-seeking bees with its bright colors and multiple textures for reproduction. Interestingly, the flower has two different kinds of pollen on it–sterile pollen on the hood of the flower, and fertile pollen on the ring of stamens. The strongly fragrant Cannonball Flower grows off of stalks that shoot out from the tree trunk below the tree’s limbs. 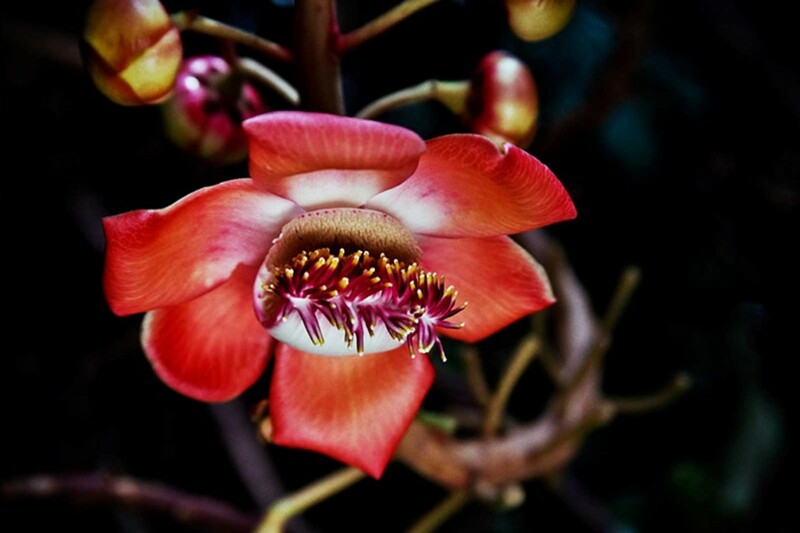 The Cannonball Tree and its flowers were introduced to Hawaii from the Amazon Basin, the Caribbean, and India. The trees are typically found in Hawaii in botanical gardens or resorts with grounds big enough to accommodate the large tree.